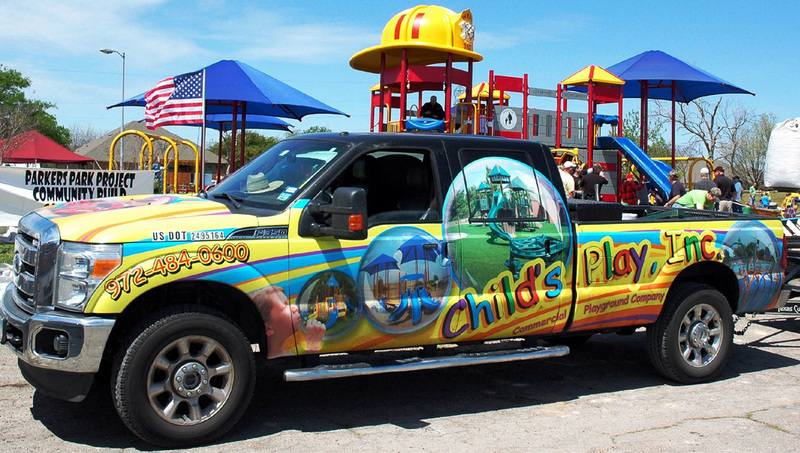 Child’s Play Inc. is a full service, award winning, turn-key park and playground company operating in Northern Texas and Oklahoma since 1996. As an industry leading company with over 20 years in business, Child’s Play Inc. is your one stop shop when it comes to Park and Playground Equipment. Whether you are looking for a shade canopy, sports goals, surfacing, pavilions, playground equipment, outdoor musical equipment, or a fully accessible playground, Child’s Play Inc. is the company for you. Our qualified staff can make you decisions easy and help you through every step of the process from budgeting, fund raising to the design and sales process, and even during the installation and service after the sale. We value each and every potential customer and will go the extra yard to be sure you become a happy customer. Making happy customers is what Child’s Play is all about. We have the means to source items even if it means going to a competitor for that one item you want - "Don’t make a mistake because of one item you want." Building your dream and making a Happy qustomer is what we are all about." Show a discount and add money back into the freight & or installation. Ask us if your quote shows this? Claim to get equipment from multiple high quality US manufacturers, change the model number or name and mark them up for a higher list price and lead you to believe 50% off this marked up price is a good deal. Remember, 50% off of 150% is not a good deal! Check with us to see if you quote comes from a legit company & compare pricing. Claim their warranty is the same, because their plastic is warranted for 15 years, and don’t tell you their warranty is prorated similar to a car battery. They also don’t give you a new warranty when an item is warranted and that item may break again and you get stuck paying 100%. Let us give you a true side by side comparison. Sell foreign playground equipment, which has sub-par quality of plastic that fades or cracks before reaching the 8th year. Whatever you do, check with us first. Buy the best quality, US made playground equipment at the best price – Call Child’s Play Inc. Blame installation problems on their installation company & because they are owned by separate owners they have no control over getting the issues fixed. They have done all they can do. Let us take control of your project and offer you a turn-key solution for all your playground & recreation needs. Claim Child’s Play Inc. cannot offer what they offer and cannot do what they say they can do. Let us explain to you how we can do what makes our competition so mad and claim we can’t because they can’t. Competition is good for the buyer! Copyright 2019 by Child's Play, Inc. All rights reserved. Website designed by Foremost Media®.